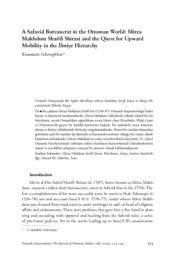 This present article examines Mirza Makhdum Sharifi Shirazi’s (1540–87) life and career in the Ottoman Empire. Mirza Makhdum was a high-ranking Twelver Shiite bureaucrat in Safavid Iran, but after taking refuge with the Ottomans, he converted to Sunnism and started a new career as a judge in Diyarbakir, Bilad al-Sham, Baghdad, and the holy cities of the Hijaz. In this article, emphasis has been on his employment and professional advancement in the ilmiye, a milieu that was open on the one hand, but maintained ideological and institutional limitations on the other. I take the horizontality of his ilmiye career as a lens through which to explore nuances and complexities of professional advancement among the Iranian recruits of the Ottoman bureaucracy during the 16th century.